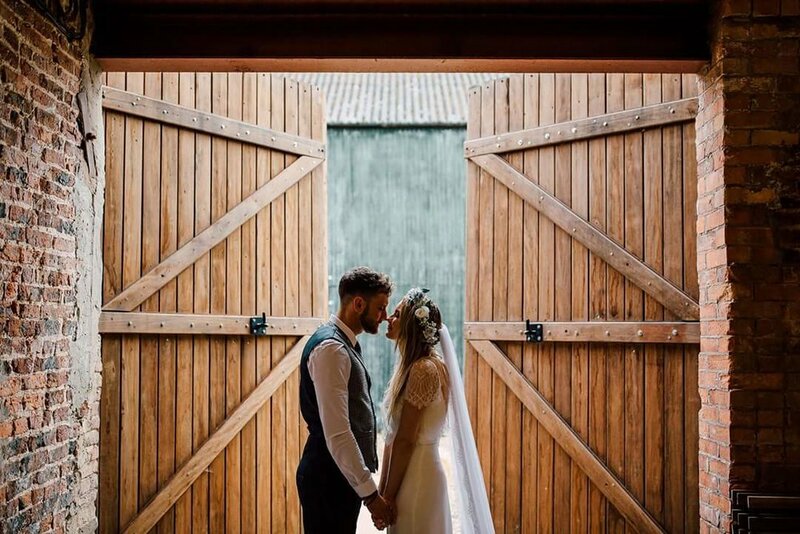 The Barns is a wedding venue for people looking for something different, relaxed and rustic with the freedom to create a wedding, event or celebration which fits them. Set on our family farm in open countryside in a beautiful riverside location, The Barns is the perfect, peaceful location in which to hold your special day. The stunning views provide you with a wealth of unusual photo opportunities. You can get married in the licenced 18th century brick barn, enjoy drinks and games in the courtyard, field and secret garden, chill by the fire-pit on luxurious leather chesterfield sofas, and eat, drink and dance in the 18x9m wooden party barn. All the facilities are exclusively yours for the duration of your event, to give you complete privacy. We want you to feel at home here, so we only offer one wedding per weekend and one in the week. This means you get the full day before to set up and the following morning to collect your decorations. At The Barns you have the flexibility to create your own bespoke day, while always having a wedding coordinator on site to ensure everything runs smoothly. We offer as little or as much as you require when planning your wedding, from discussing your inspiration and ideas to providing you with our recommended suppliers list. Whether you have 20 or 200 guests, The Barns is an idyllic and unique setting in which to create wonderful memories.